A versatile blend of spirit, ginger beer and citrus, the buck is among the simplest and most famous of drink categories. Here, get to know the buck in three classic recipes—the Dark 'n' Stormy and Moscow Mule among them—and their modern interpretations. A close relative of the Collins and the cooler, the buck distinguishes itself by the inclusion of ginger beer, which is added to a base spirit, livened with a squeeze of citrus and served over ice. And while the name, “buck,” might not be a common bar call, the same cannot be said about the drink’s two most famous iterations: the Dark ‘n’ Stormy and the Moscow Mule. Born from a long lineage of ginger beer-based buck cocktails, this mixed drink featuring vodka, ginger beer and lime juice was created in the early 1940s. Most accounts credit the origins to a alcohol-fueled Hollywood meeting. This simple mix of dark rum and ginger beer over ice has roots in colonial Bermuda, where England’s Royal Navy opened a ginger beer plant in the late-19th century. With its unique ability to pair with just about any base, from peaty Scotch to mezcal to dry gin—the latter, a Prohibition-era favorite—the buck has been an enduring, year-round staple since its creation in the late 1890s. Thought to have originated in near-parallel to the drier Rickey (a combination of spirit, lime and soda), the buck’s central component, ginger beer, arose much earlier in mid-18th century England, where it served as a popular digestive aid. With all likelihood, the first buck, known today as the Dark ‘n’ Stormy, was created by Royal Naval Officers, familiar with ginger beer, who mixed it with Gosling’s Black Seal rum while stationed near the company’s headquarters in Bermuda. The Moscow Mule, arguably even more famous, has a tidier origin story—a rare occurrence in the drink world—which, in its confluence of cocktails and capitalism, could hardly be more American. In a serendipitous, alcohol-fueled meeting, it’s said that the drink’s creation was the result of three businessmen unloading two underperforming products; ginger beer and Smirnoff vodka. (It was based, by many accounts, on the Mamie Taylor—a popular ginger and Scotch highball invented sometime around 1899 in Rochester, New York.) When placed in its now-classic copper mug, the drink effectively became a marketing device, representing, most notably, the first time that a specific drink had been used to advertise a spirit. 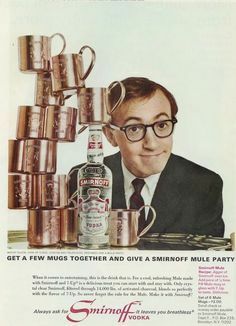 Before long, thanks in part to celebrity-driven ads celebrating “Mule Parties,” vodka would go on to supplant both whiskey and gin as the country’s preferred spirit, a title that it would hold until the latter part of the 20th century. Today, thanks in part to its versatile template, not to mention the ever-growing popularity of ginger in drinks, the buck is ripe for rejiggering. Here, three classic takes on the drink alongside their modern interpretations. Though per the official patent on the drink’s name, filed in 1991, the Dark ‘n’ Stormy includes just two ingredients—rum and ginger beer—many modern interpretations favor a squeeze of lime to round out the flavors. From there, it stands as an example of the buck’s very basic template. Swapping in gin for rum, as is the case in the Watership Down (which sees the addition of dry vermouth) and the Go-To (which plays off additional flavors of cucumber and mint), the buck functions as a decidedly summer-ready drink. The inclusion of bitter Cynar and Amaro Montenegro, as is the case in Jamie Boudreau’s Italian Buck, proves how easily the cocktail can transition into fall. Named for singer and actress, Mayme Taylor, this (inexplicably) misspelled drink—a combination of Scotch and ginger beer—was a popular cocktail throughout the first half of the 20th century and likely inspired the creation of the Moscow Mule. Not only does it build on the buck’s inherent versatility, it showcases how well Scotch can play with flavors of ginger and citrus, as is the case with the Glasgow Mule, which sees the addition St. Germain. Similarly appealing to the whiskey drinker are the Kentucky Buck and the Poppa’s Pride, which call on bourbon as their base spirit. Perhaps the most famous example of the category, the Moscow Mule remains a summer favorite. While the Laughing Buddha builds on the original formula by adding citrus vodka, spicy serrano chile and an anise- and clove-studded agave nectar, a simpler route is simply to stick to the original formula and freeze it. Adding ice—and a blender—transforms the cocktail into an even colder, summer-ready, modern classic.